The No. 1 Ladies' Detective Agency: Mystery and Suspense on Television. Based on the bestselling novels by Alexander McCall Smith, The No. 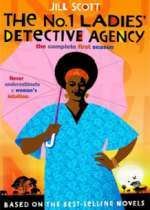 1 Ladies' Detective Agency was an HBO series that starred Jill Scott as Mma Ramotswe. The series was filmed entire on location in Botswana. Though only nominally a crime drama, like the books on which it is based, the series is more character driven than plot driven.